NEW YORK, NY (January 16, 2013) – Jack Geary Contemporary is pleased to announce the opening of his inaugural exhibition, Ayse Wilson: Recent Works. Featuring Wilson’s recent paintings and works on paper, the exhibition focuses on the role childhood experiences play when it comes to growing up. The show will be on view February 8 - 24 at Site/109, a pop-up space for exhibitions, located on Manhattan’s Lower East Side. “In her recent work, Ayse Wilson mines the threshold between infancy and adolescence, innocence and experience,” says Peter Benson Miller, an independent curator. 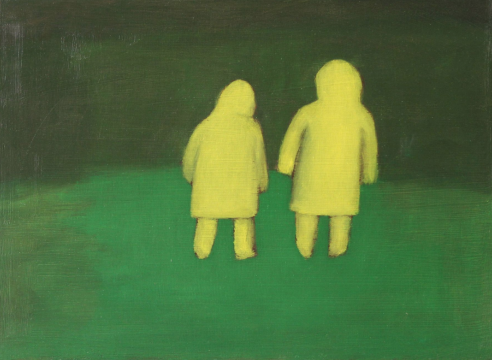 Inspired by her imagination and found photographs, Wilson paints images of children, in isolation as well as in groups, all set against monochromatic backgrounds. Examining themes of fantasy and innocence, the figures are generalized and take on an illustrative quality that recalls cartoons and Japanese anime.